Just perfect for your fairy tale wedding. 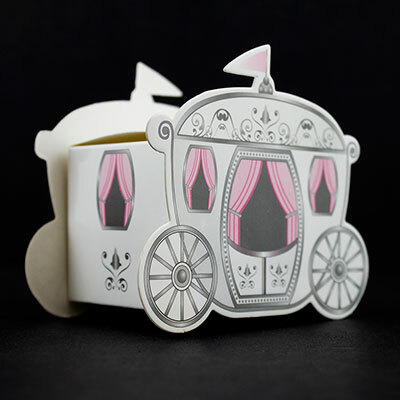 Traditionally designed with silvery scroll work and pink accents, the Enchanted Carriage box will create a wonderful fairy tale atmosphere at your reception. Fill with your choice of goodies. They measure 3' h x 3' w x 1' deep. Easy pop-up design. These boxes are sold in sets of 24. All amounts are available. (in sets of 24) Smaller amounts are more expensive per set.